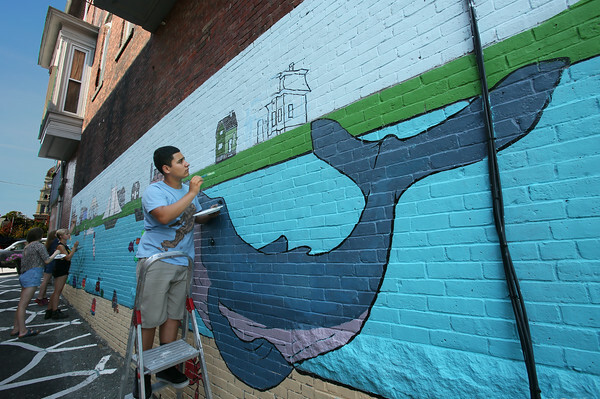 Edgardo Pagaza, 15, helps paint a mural Monday in an alleyway next to Fabola on Main Street in Gloucester. Pagaza and about a dozen other members of Art Haven's Teen Artist Guild began painting the mural a panoramic of Gloucester combining underwater and above-water scenes -- earlier in the month, during Painter's Week at Art Haven. The teens were helped early in the project by a group of younger artists, who painted some of the underwater creatures, like lobsters and crabs. The group expects to finish the mural by the end of the week. Art Haven is asking property owners who are interested in having murals painted on their walls to contact the organization.